Hours after returning from a trip where he lavished praise on one of the world's worst dictators, President Trump declared that America's biggest enemy is... "fake news." He singled out NBC and CNN in his angry tweet on Wednesday. Trump frequently portrays the news media as one of his enemies, but rarely has he been this blunt about it. Wednesday's tweet harkens back to February 2017, when he called several news outlets "the enemy of the American People!" He was roundly criticized back then. This time, there's been a somewhat more muted reaction, perhaps because he is repeating himself. But it's important to recognize just how extreme this rhetoric is. No modern American president has publicly spoken this way about the press. Richard Nixon sometimes talked this way, but only in private. "Never forget, the press is the enemy. The press is the enemy. The press is the enemy," Nixon told his advisors, according to Oval Office recordings. Trump relishes the fight. Time and time again, he seizes us-versus-them opportunities, casting the media as an opponent that must be defeated. He says he likes some reporters, but labels others as "dishonest" examples of "fake news." Wednesday's tweet was apparently provoked by news coverage of Trump's summit with North Korean dictator Kim Jong Un. "So funny to watch the Fake News, especially NBC and CNN," he wrote. "They are fighting hard to downplay the deal with North Korea. 500 days ago they would have 'begged' for this deal -- looked like war would break out. Our Country's biggest enemy is the Fake News so easily promulgated by fools!" New York Times reporter Maggie Haberman translated the tweet this way: "Someone is unhappy with headlines reflecting what happened instead of what he wants to say happened." MSNBC's Lawrence O'Donnell asked: "What deal? 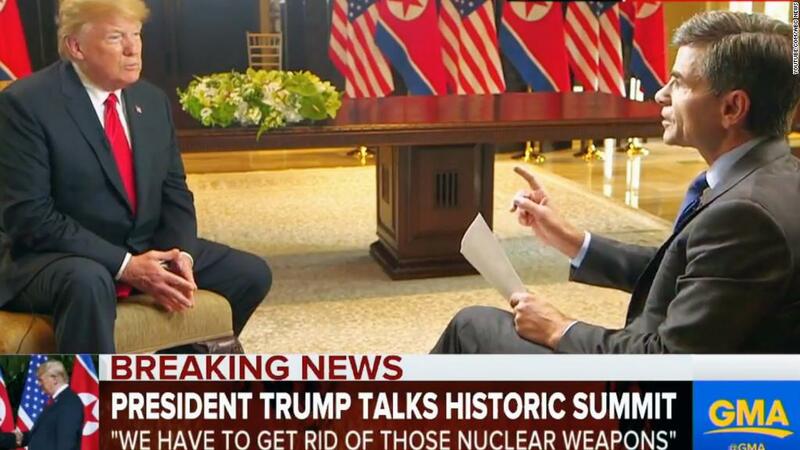 There is no deal with North Korea." On Twitter (of course) there was some speculation that the presidential tweet was written by someone else, given the use of the word "promulgated." Regardless, it came from his account. The tweet quickly became one of Trump's most-shared posts of the day. Some journalists expressed astonishment at Trump's message. Others laughed it off. Journalism professor and entrepreneur Dan Gillmor used the occasion to tweet a message to the news industry. "Dear journalists," he wrote, "once again: When someone declares war on you and on freedom of expression, you have two options. 1) Surrender (what many have done already by normalizing this stuff). 2) Find allies and fight like hell to protect freedom of expression for everyone, not just you." The tweet came in the wake of a wave of attacks launched on Jim Acosta, CNN's chief White House correspondent. Trump officials and their allies in the media attacked Acosta for asking Kim and Trump questions during a signing ceremony at the Singapore nuclear summit. In plainer words, Acosta was assailed for doing his job. Brad Parscale, the Trump 2020 campaign manager, said Acosta's press credentials should be "immediately" suspended, calling the journalist an "absolute disgrace" on Twitter. In a Fox News appearance, Kellyanne Conway, counselor to the president, responded to a question on Acosta, saying that there is a "time and a place" to ask questions, urging journalists to be a "polite house guest." Acosta responded on Twitter to the suggestion he have his press credentials revoked, tweeting, "Dictatorships take away press credentials. Not democracies." -- CNN's Oliver Darcy contributed reporting.